These are my stories: the weight of a shell on my back, the rustle of undergrowth as hunters approach, the sight of an illness inside Ilhuh's foot, the sharp death of spears in a fur-covered flank, the song and the pounding of seeds, the long nights, the long days, the laying of eggs, the best songs and gifts to encourage a baby to stay, the best plants, the poisonous plants, the weight of stars on my wings. Alex Dally MacFarlane lives along the Thames, writing and researching history. One of her current projects is a series of poems based on archaeological finds, to which "Bowl" belongs. Others can be found in past issues of Stone Telling, Through the Gate and Mythic Delirium. Her recent stories about the future and foxes are in Clarkesworld, The Other Half of the Sky and Heiresses of Russ 2013: The Year's Best Lesbian Speculative Fiction, and she is the editor of Aliens: Recent Encounters (2013) and The Mammoth Book of SF Stories by Women (forthcoming in late 2014). 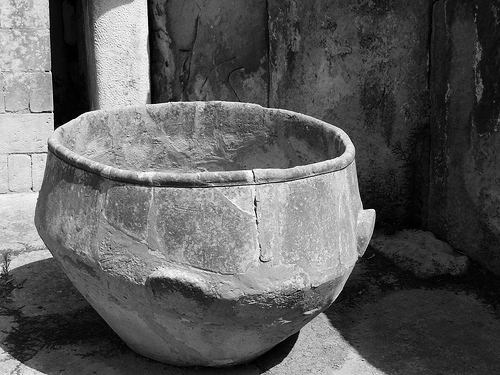 Photography: adapted from STONE AGE BOWL–TARXIEN TEMPLES, by Peter Grima.